12:00 noon: Backstage tour of the theatre, giving you and your children the chance to see how the stage management team and technical crew prepare for the production. 2:00 pm: Performance of Baddies: the Musical – approximately 2 hours including an interval. 4:00 pm: A post-show, up close and personal meet and greet with some of the Baddies actors. IMPORTANT: For admission to the show, you must contact Ms Lorna Killin, Development Manager at the Unicorn Theatre: 0207 645 0523 or lorna.killin@unicorntheatre.com. You will not have tickets to the show unless you pay Ms Killin. Tickets will be picked up from the theatre on the day of the event at the YCL sign-in area. For admission to the pre- and post-show events please register here via the YCL website. Join us for this very special afternoon of theatre and pre-show stage tour and post-show meet and greet with some of the members of the cast. 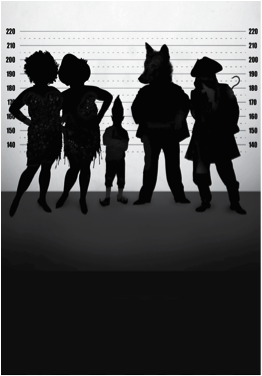 Baddies: the Musical imagines what happens when five notorious villains from well-known fairytales; the Big Bad Wolf, Rumpelstiltskin, The Ugly Sisters and Captain Hook, are under threat of being thrown out of their own stories by the Council of Bedtime Stories who want to rebrand them. The Council has decided that villains are irrelevant, a bad influence and ultimately unnecessary. They have decided that instead, children want and need tales of beauty - featuring heroes and heroines who look good and who succeed in everything they do. Under the Council’s critical eye, the baddies are at risk of being transformed into bland, sugar-coated ‘goodies’ forever. But if the Council succeeds in removing the baddies, what will happen to all their stories? However, in Nancy Harris and Marc Teitler’s Baddies: the Musical we are challenged to question notions of good and evil; who is really bad, who is really good and what do those terms mean anyway? Exactly how bad are these baddies? Are they innately bad or are they misunderstood? In the process, the audience may discover a surprising level of empathy and appreciation for the more traditionally unpopular fairytale characters. This Christmas, someone's decided to change the fairytale rulebook and no-one seems to know why. How are you supposed to tell who the good guys are when there are no baddies around? Step into the lives of everyone's favourite villainous characters and find out. This sublimely entertaining and larger-than-life new family show is sure to be the baddest musical in town! Recommended age is 6+ for children, but probably not appropriate for young ones who scare rather easily.